Managing Commodity Risk is a clear and practical guide to managing commodity risk and explains how the commodity futures markets can be used to the manager's advantage. Beginning with a general overview of the definitions, processes and procedures, the book then explains in detail each of the individual approaches and looks at topics such as the commodity markets and their instruments, hedging with commodity futures and options and commodity futures exchanges. There is a checklist with key issues and approaches raised at the end of each chapter. This book is a practical primer for business managers who wish to manage and minimise the risk within their own industry. JOHN J STEPHENS has considerable practical experience of commodities trading and runs a training company specialising in the futures and futures options markets. For 10 years he was CEO of a management consultancy firm with many large international clients, whilst from 1992 onwards he worked in the financial services sector for first SANLAM and later ABSA Bank, specialising in market and financial product development. He is also an advocate of the Supreme Court of South Africa. 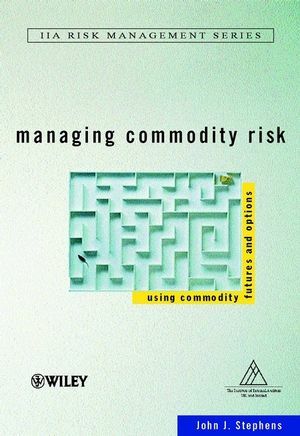 Commodity Risk, Commodity Futures and the Management Function. The Commodity Markets and Their Instruments.